Articles from the Wheelchair Foundation headquarters in Danville, CA and major news source outlets. Welcome To The Wheelchair Foundation App! Wheelchair Foundation is proud to announce the launch of our new app powered by ViewSpark. From your smartphone, you can now stay up to date on all of our exciting developments and receive real-time updates including photos and videos while we’re delivering wheelchairs around the world. Simply text the word WHEELCHAIR to the number 555888 and you’ll receive a link to download our FREE app. The app is available on both the App Store for iPhone or Google Play for Android devices and you can click the buttons below to download. We look forward to sharing these updates with you and feel free to share this with any of your friends! Click the button for your device to download our mobile newsfeed app. This article was originally written by Conric PR and can be found here. Rotary District 6960 District Governor Cyndi Doragh is pleased to announce that the district has donated more than $140,000 to the Wheelchair Foundation in the past year. This level of funding will provide mobility to approximately 1,400 people in need through the foundation, which aims to provide a free wheelchair to every child, teen and adult worldwide who needs one but cannot afford one. Since the early 2000s, Rotary has partnered with the foundation, which in 2015 delivered its one-millionth wheelchair since its inception. Upon assuming her position as District Governor, Doragh named the Wheelchair Foundation as the beneficiary of her year-long community service project, which culminated at the District Conference last month. While most of District 6960’s wheelchairs had been delivered to needy countries in the Caribbean, Central America and parts of South America, Doragh turned the focus to the need within the Southwest Florida community. Under her leadership, the district’s 50 Rotary clubs accepted the challenge to provide 1,100 wheelchairs, at a cost of $110,000, over the course of the year. By the first of May, funding for approximately 900 wheelchairs had been raised. At the District Conference, held May 12-15, Wheelchair Program Chairman Steve Agius presented 30 wheelchairs to Rev. Dr. Israel Suarez, founder and CEO of Nations Associations Charities, who introduced two of the recipients, Maria and Francisco. Ten wheelchairs were presented to Ralph Santillo, founder and president of Invest in America’s Veterans. Conference attendees rallied to raise enough additional funds to purchase 200 more wheelchairs, surpassing Doragh’s goal, with donations continuing even after the conference to exceed $140,000 as of June 1. Rotary is an international organization of business and community leaders working together through friendships and building relationships in an effort to serve others and do good in the world. It is a secular organization open to all people regardless of race, color, creed, religion, gender or political preference. There are more than 32,000 clubs worldwide composed of 1.2 million individual members. Rotary District 6960 in Southwest Florida has more than 50 clubs. Rotary’s purpose is to provide humanitarian services, encourage high ethical standards in all vocations, and to advance goodwill and peace around the world. Rotary’s primary motto is “Service Above Self;” its secondary motto is “One profits most who serves best.” For more information visit RotaryDistrict6960.org. Celebrating 11 Years of Hope, Mobility & Freedom! June has always been a special month for the Wheelchair Foundation, and 2011 was certainly no exception. Since the year 2000, we have been providing wheelchairs to adults, teens, and children in need and have changed the lives of more than 850,000 people in 153 countries in an effort to distribute at least one million wheelchairs worldwide. Thanks to the generous and continued support of our donors, we’re closer than ever to reaching that goal. On Monday, June 13th, the Wheelchair Foundation proudly celebrated its 11th anniversary, with over a decade of delivering hope, mobility, and freedom around the world. 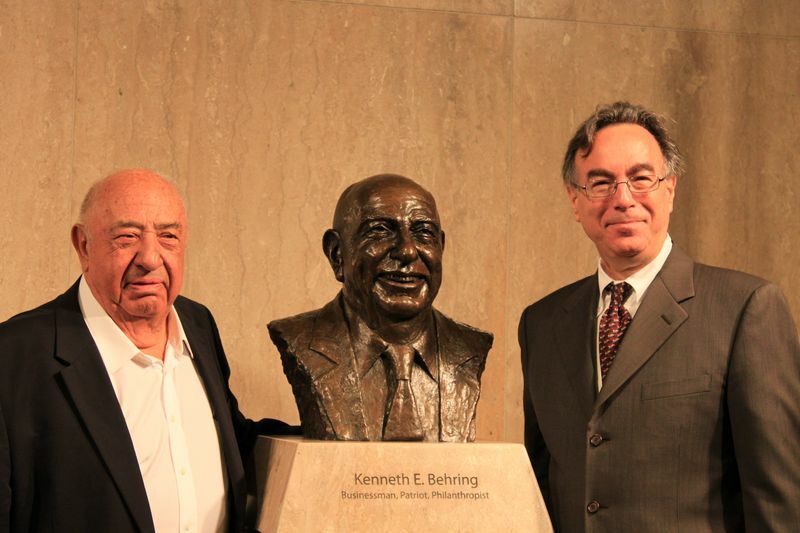 Kenneth E. Behring, founder of Wheelchair Foundation, with Smithsonian bust and its sculptor, Marc Mellon. As the Wheelchair Foundation enters another year, we mark this special occasion by reflecting on how much we’ve accomplished and by looking ahead to what we hope the future will hold. The history of the Wheelchair Foundation is an inspiring lesson of how one person can make an incredible difference in the lives of others and effect a positive change in the world. It began with one man – a man who embodies the spirit of giving with his kindness and compassion, who believes that history is an integral part of education, benefitting all generations who learn from the past. The vision of Kenneth E. Behring, founder of the Wheelchair Foundation, became an international cause that would improve the lives of thousands of disadvantaged people across the globe. Guided by Mr. Behring’s core values as a patriot, humanitarian and philanthropist, the Wheelchair Foundation forges ahead with commitment for another successful year of delivering Hope, Mobility, and Freedom. 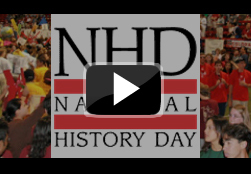 VIDEO – Kenneth E. Behring explains why he feels National History Day is so important to the education of today’s students. 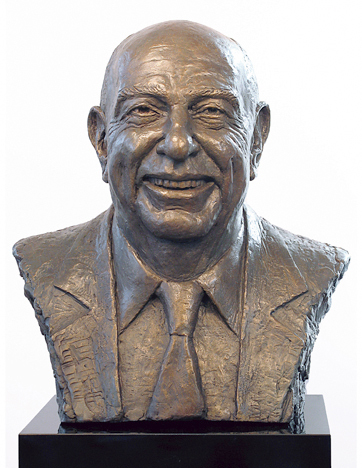 Kenneth E. Behring received an honor few living men have known on June 15th, when the Smithsonian Institute in Washington, D.C. unveiled a bronze bust immortalizing the great philanthropist for his outstanding contributions to that institution. Cast in his likeness by one of America’s foremost representational sculptors, Marc Mellon, the larger-than-life sized work of art stands on the second floor of the National Museum of American History. This award honors Mr. Behring’s $80 million gift in 2000 and his $20 million contribution in 1997 to the National Museum of Natural History. Mr. Behring attended the unveiling ceremony with his son, David Behring, president of the Wheelchair Foundation, in Washington D.C.
topics related to a theme which they ultimately present in the form of original papers, websites, exhibits, performances and documentaries. After spending months on research and preparation, their projects are entered into competitions at local and state levels, and the program culminates in a national competition each June held at the University of Maryland at College Park. The children who take part in this event develop an appreciation for history – a quality that Kenneth E. Behring, as the primary sponsor, regards as invaluable. Your Support Brings Us Closer to One Million! The Wheelchair Foundation is proud to announce a milestone achievement towards our goal of providing at least one million wheelchairs to adults, teens, and children around the world. The 850,000th wheelchair recipient received her life-changing gift on March 16th, 2011 at our recent distribution in Costa Rica. Joining us on our mission were Rotarians from Rotary Club Districts 5220 and 5230, who graciously contributed their time and money to help make this landmark number a reality. Our lucky recipient was an adorable four-year-old girl named Isabella. Isabella was born with myelomeningocele, a birth defect of the backbone and spinal canal. She and her twin brother have been living in foster care for three years with their adoptive mother, Charlotte. Charlotte is determined to adopt Isabella’s nine other siblings, all living in foster care, so the family can stay together. Isabella, a bright, energetic girl, had been living without mobility and was dependent on her mother for almost every need. Like most children her age, she longed for the ability to play and move about on her own. 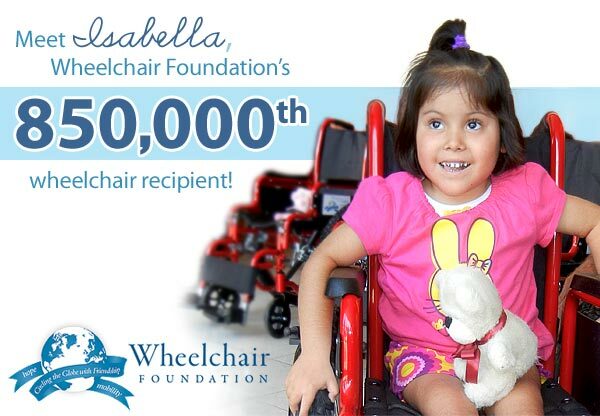 Isabella’s dream came true as she was placed in her brand-new, shining red wheelchair. She immediately began moving around at the Rehab Center, wanting everyone to watch what she was able to do. Bob Bitter of Madera Sunrise Rotary Club and Past District Governor of District 5220 describes the experience, saying, "To us, the most memorable moment of a wheelchair distribution is the hands-on ability to immediately change a person’s life for the better, and to experience the joy they feel with their newfound mobility. We have helped people move themselves for the very first time, and witnessed the weight being lifted from their family members who were, until now, responsible for that person’s mobility." Another Rotarian also commented that despite the fact that Costa Rica has one of the highest standards of living in Latin America, there is still a great need for wheelchairs. This need, however, is not exclusive to Costa Rica. There are thousands of children, just like Isabella, in countries around the world who are still awaiting the freedom and dignity a wheelchair can bring. Make a donation today and give a life-changing gift to a man, woman, or child desperate for mobility. Visit our Facebook page to view videos of Isabella and more photos from Costa Rica! A young girl recovers in a wheelchair from the Wheelchair Foundation. January 20th of 2011 marked the one year anniversary of Wheelchair Foundation’s Plane to Haiti relief flight. The opportunity to join among the world’s first responders to the catastrophic Haitian Earthquake, and to be granted permission to land our two plane loads of medical aid, doctors and nurses, is a testament to the work of Global Health and Education Foundation and all of its’ assets. As quickly as Haiti’s tragedy came to the public eye it soon faded, as other world news took precedence. CODETEL, our wheelchairs have reached Port au Prince, Cayes, Jacmel, Cap-Haitien, Fort Liberte, Jermine, Hinche, Port de Paix, Anse a Veau et Miragoane, and Gonaives. Our efforts to assist the disabled in Haiti will continue, with 800 wheelchairs sponsored by Rotarians staged in Miami, Florida, awaiting transport to Haiti. We will continue to help, as long as there is a need. KGO-TV/DT – Written and produced by Ken Miguel, March 15, 2010. A wheelchair can mean the difference between being bed-ridden or leading a productive life. But in many parts of the world, cost keeps them out of the hands of people who need them. One East Bay charity is hoping to make a difference two wheels at a time. On the island of San Pedro in Belize, artist Kurt Jason Cruz was attacked in 2006. It left him completely paralyzed. “I got stabbed in my lower back and neck and was paralyzed for four months and I couldn’t even move from neck down,” he said. He has regained some mobility, and can now get around thanks to the Danville-based Wheelchair Foundation. The non-profit has given away hundreds of thousands of wheelchairs over the past decade to people in need all over the world. The idea began with developer Ken Behring. Now his sons have taken up the cause.